HUMPHREY WINS THREE ON WEDNESDAY’S CARD AT CHURCHILL DOWNS – Owner G. Watts Humphrey Jr., a staple to Kentucky racing, captured a trio of races on Wednesday afternoon’s 10-race program at Churchill Downs. Humphrey, a native of Cleveland, Ohio, began the Wednesday program with his 11-1 longshot Snuck Out capturing a maiden special weight contest by 1 ¼ lengths under jockey Edgar Morales. In Race 9, Humphrey teamed up with Ashbrook Farm for a 1 ¾-length score with homebred Space Mountain in an allowance optional claiming event. In the finale, Humphrey’s homebred Key Moment dominated a $15,000 maiden claiming event by 10 ¾ lengths. Humprhey, who raises Thoroughbreds on his 1,000-acre farm near Harrodsburg, Ky., divides his horses between his longtime trainer Arnold and his daughter Vicki Oliver. Raised in Cleveland, Humphrey earned a Bachelor’s Degree from Yale University and is a veteran of the U.S. Marine Corps. Humphrey is the former chairman of the board of directors for Churchill Downs Inc. and his long-rooted history in the Thoroughbred industry spans positions with The Jockey Club, American Horse Council and Breeders’ Cup. HOT SPRINGS MADE 2-1 FAVORITE FOR SATURDAY’S GRADE III COMMONWEALTH TURF – Woodford Racing’s Jefferson Cup winner Hot Springs was installed as the 2-1 morning line favorite as he tops a field of seven in Saturday’s 15th running of the $100,000 Commonwealth Turf (Grade III) at Churchill Downs. The complete Commonwealth Turf field from the rail out (with jockey, trainer and morning line odds): Reride (Florent Geroux, Asmussen, 4-1); Marzo (Albin Jiminez, Ben Colebrook, 12-1); Sniper Kitten (Tyler Gaffalione, Mike Maker, 7-2); March to the Arch (Julien Leparoux, Mark Casse, 5-2); Year of the Kitten (Corey Lanerie, Maker, 15-1); Zero Gravity (Adam Beschizza, Joe Sharp, 8-1); Hot Springs (Santana, Asmussen, 2-1). 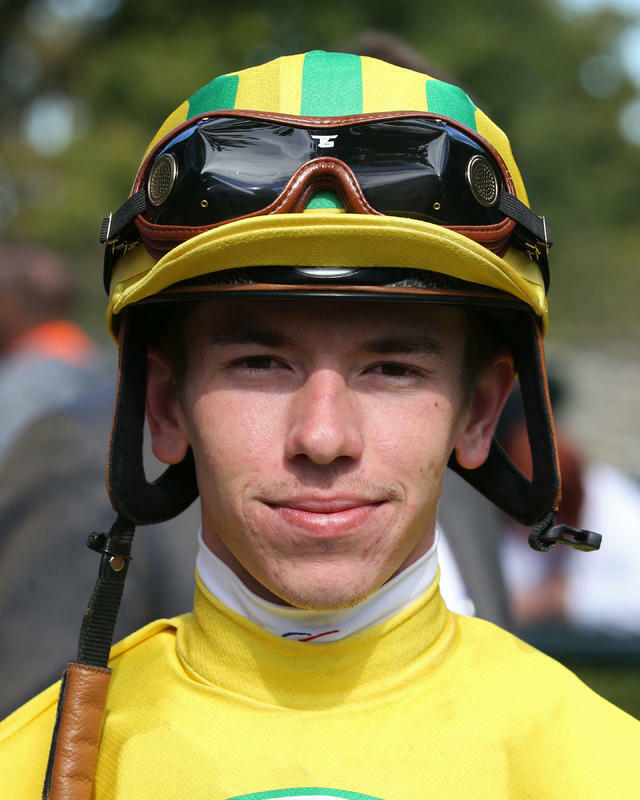 CARROLL RIDES FIRST WINNER AT CHURCHILL DOWNS – The smile was difficult to remove from 19-year-old apprentice jockey Declan Carroll’s face Wednesday as he ran back to the jocks room following a gutsy rail-skimming ride aboard Space Mountain to capture Race 9 at Churchill Downs – his first victory beneath the historic Twin Spires. Carroll’s path to horse racing seems natural with his father, David, a retired trainer and now assistant to Mark Casse and mother, Kim, an exercise rider for Casse. Carroll’s sister, Aisling, is an event rider with Olympic equestrian Phillip Dutton. DOWN THE STRETCH – Racing at Churchill Downs continued Thursday with a first post of 1 p.m. (all times Eastern). There is a $41,378 carryover in the 20-cent Single 6 Jackpot which began in Race 5 at 3:03 p.m. … Join Churchill Downs Racetrack’s Darren Rogers and Kevin Kerstein for “Inside Churchill Downs” Friday at 6 p.m. on ESPN 680/105.7. The one-hour show features prominent trainers, jockeys and handicappers. To listen live, visit www.espnlouisville.com. … There will be a Veterans Day celebration Sunday at Churchill Downs where active and retired military members are invited to enjoy a day at the races with free general admission or a discounted $29 ticket price for Millionaires Row. To purchase tickets, contact groupsales@kyderby.com or call 502-636-4450. … The first 5,000 fans on Sunday will receive a free 2019 Churchill Downs wall calendar sponsored by Humana. For more information, visit: https://www.churchilldowns.com/calendar/2018-11-11. … Churchill Downs Today will air every race day at noon on TwinSpires.com and across simulcast outlets. Join Churchill Downs Racing Analyst Joe Kristufek along with TwinSpires.com’s Ed DeRosa, James Scully, Scott Shapiro and Brandon Stauble as they handicap the day’s races. … Churchill Downs all-time leading trainer Dale Romans is on the cusp of 2,000 career wins. The South Louisville native began the week with 1,994 wins and has nine entries on Thursday-Saturday.